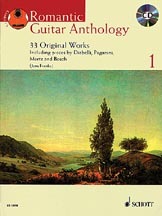 A collection of 19th century works for guitar by 13 composers and didactic works by the 19th century's leading guitar composers. Includes previously unpublished material by Johann Kaspar Mertz together with rarely available works by Jaime Bosch, Jose Ferrer, and Franz Tucek. The CD features all of the pieces played by Jens Franke. The pieces are graded and presented in a progressive order. This comprehensive resource also includes composer biographies.